All Affiliate Institutions have a full deployment of COUNTER within their My Institution Dashboard. The Account Usage Totals Report provides you with totals for all manner of ways that your patrons use your institution’s account by month and year. The report is a supplemental report that was not included in Release 1 of the COUNTER Code of Practice for Books and Reference Works (published March 2006). The only criterion for the report is for you to select a year. The default year is the current one. 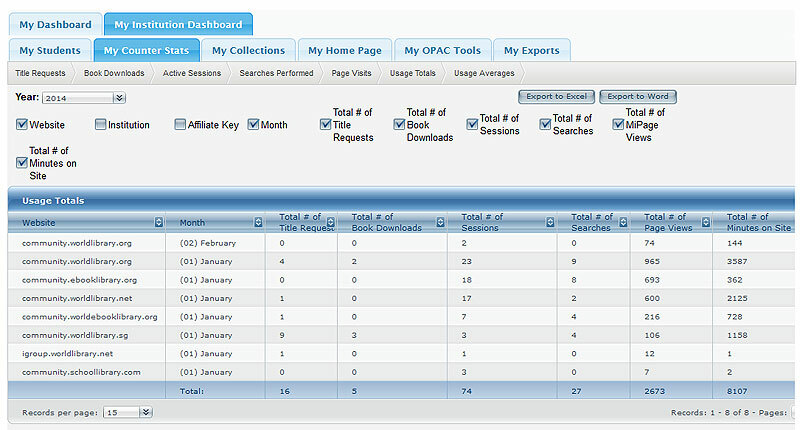 The report provides a month-by-month count of the Total Number (#) of Title Requests, the Total Number (#) of eBook Downloads, the Total Number (#) of Active Sessions, the Total Number (#) of Searches Performed, the Total Number (#) of Account Page Visits, and the Total Number (#) of Minutes of Active Sessions. A full description of Title Requests can be found under the Title Requests tab. A full description of eBook Downloads can be found under the eBook Downloads tab. A full description of Active Sessions can be found under the Active Sessions tab. A full description of Searches Performed can be found under the Searches Performed tab. A full description of Account Page Visits can be found under the Account Page Visits tab. The Total Number (#) of Minutes of Active Sessions is the amount of time patrons were determined to have spent using your institution’s account. This is the sum total (of minutes) of all the sessions (in a given month) of the time spent using the account for each session. While we use The COUNTER Code of Practice for Books and Reference Works as a guideline for our reports, we are not an official member of COUNTER nor do we participate in independent audits. However, we do conduct quarterly internal audits and provide enhanced reporting that goes beyond the recommendations provided by COUNTER. This section lists the COUNTER Usage Reports for books and reference works and specifies the content, format and delivery specifications that these reports must meet to be designated “COUNTER compliant”. Vendors must supply the Usage Reports relevant to their COUNTER compliant online product categories (as listed in the COUNTER Register of Vendors) at no additional charge to customers. Customer accounts, and access and entitlements to vendor sites, are organized in a number of different ways. Most commonly this is done by IP addresses or by username/password. The vendor must provide the functionality to create Usage Reports on different levels for the customer at the Consortium, Consortium Member, Institute or Department level, as specified by the customer. Reports should be made available on a password-controlled website (accompanied by an email alert when data is updated). Access to consortia level reports must be through the same user id and password for all consortium members. This user id and password must be different from those used for administrative purposes for each institution. Reports must be readily available. Data must be updated within four weeks of the end of the reporting period. All of last calendar year’s data and this calendar year’s year-to-date data must be supplied. Usage data collected by vendors/intermediaries for the Usage Reports to be sent to customers should meet the basic requirement that only intended usage is recorded and that all requests that are not intended by the user are removed. The way usage records are generated can differ across platforms, hence it is impractical to describe all the possible filters used to clean up the data. This part of the COUNTER Code of Practice, therefore, specifies only the requirements that need to be met by the data to be used for building the reports. Usage data can be generated by the web server holding the content (log files), or by storing the usage information in so-called ‘key-events’ at content holding databases. A. Only successful and valid requests should be counted. For web server logs successful requests are those with specific NCSA return codes (200 and 304). The standards for return codes are defined and maintained by NCSA. In the case where ‘key-events’ are used their definition should match the NCSA standards. B. Records generated by the server together with the requested page (e.g. images (.gif), style sheets (.css)) should be ignored. 1. Where only the IP address of a user is logged that IP should be taken as the field to trace double-clicks. 2. When a session-cookie is implemented and logged, the session-cookie should be used to trace double-clicks. 3. When user-cookies are available and logged, the user-cookie should be used to trace double-clicks. 4. When the username of a registered user is logged, this username should be used to trace double-clicks. The options 1 to 4 above have an increasing level of reliability for filtering out double-clicks: option 1 has the lowest level of precision (and may lead to underreporting from the vendor perspective), while with option 4 the result will be optimal. D. The downloading and rendering of a PDF takes longer than the rendering of an HTML page. Therefore, requests by one and the same IP/username/session or user cookie, for one and the same PDF, should be counted as a single request if these multiple requests occur within a 30-second time window. These multiple requests may also be triggered by the user pressing a refresh or back button on the desktop. Release 4 of the COUNTER Code of Practice for e-Resources has been developed with input from vendors, librarians and intermediaries. This Release is a single, integrated Code of Practice covering journals, databases and books, as well as multimedia content. As such it supersedes both Release 3 of the Code of Practice for Journals and Databases and Release 1 of the Code of Practice for Books and Reference Works. The deadline date for implementation of Release 4 is 31 December 2013. After this date only those vendors compliant with Release 4 will be considered to be COUNTER compliant; vendors are encouraged to implement Release 4 before that date. Before 31 December 2013, only vendors compliant with the new Release 4, or vendors compliant with Release 3 for Journals and Databases or Release 1 for Books and Reference Works will be considered to be COUNTER-compliant.